In my last post in this series on the JOIN (What Is A Join: Part 3 (Cartesian Joins)), I discussed the Cartesian Join, which has very few uses and in most cases should be avoided at all costs. However, there is one practical use for a Cartesian join as long as you restrict its output with a WHERE clause. So far, I've created the Joins in the FROM clause of the SQL statement. This is standard SQL, but it's also possible to create an Equi-Join in the WHERE clause. As a general rule, it's better to create your join in the JOIN clause, but there are circumstances under which is it useful to do it in the WHERE, which I'll show in just a bit. 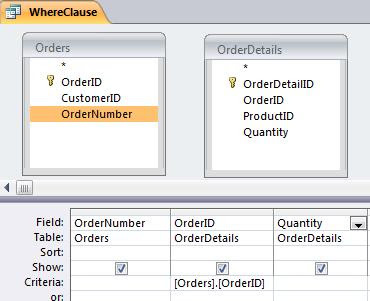 To create a Join in the WHERE clause, you create a Cartesian join and add a WHERE clause equating the common fields of both tables. 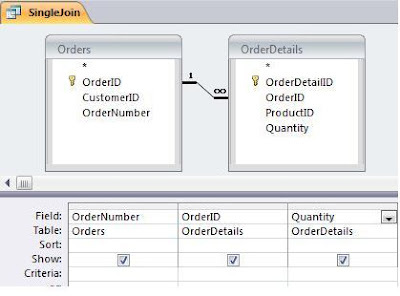 In the Query Builder, add both tables to the table window, but you DON'T create a Join line between them. If the Query Builder adds one automatically, delete it. In the WHERE clause you make the join field of one table equal to the join field of the other. Earlier, I showed that without the Where clause, I would get 28 records. However, with the Where clause, I get the same result as I did when I created the join in the FROM clause. In general, this is not as efficient as creating the Join in the FROM clause. Suppose the join fields in my two tables are different datatypes. Suppose OrderID in the Order table it is numeric and in OrderDetails it is text. This can happen when dealing with external data sources over which you have no control. You can't create a join on fields of different datatypes, so you have to use a conversion function to convert one of the fields. Since OrderID in the Orders table is a Long Integer, I can use the CLng function to convert OrderID in the OrderDetails table. This will work. However this cannot be represented in the Design View of the query. If you ever open the query in Design View, it will give you an error and remove the Join line altogether. You must close the query without saving or your query will be ruined. This can be represented in the Design View. I have also seen cases where a DateTime field in one table held just the date value, but held date and time in the other table. I needed to use the DateValue function to remove the time from the DateTime in the one table. Again, it was external data over which I had no control. In my next post, I'll look at Outer Joins.